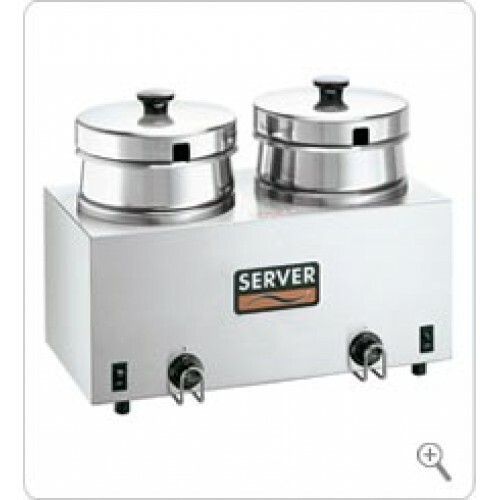 The TWIN FS-4 is a warmer/cooker that is constructed of stainless steel with stainless steel water vessels as well. Adjustable thermostats, with degree markings, exclusive hinged lids and water bath design keep your product at the perfect serving temperature. Standard features include: Stainless steel construction NSF Listed as a Rethermalization unit Adjustable, pre-calibrated thermostats for accurate heat control Two exclusive 4-qt (3.8 L) insets and lids Hinged lids stay upright during ladling for easy customer use Lid rim returns moisture to the food to retain flavor Water fill lines eliminate overflow accidents 1000 watt, 120 volts, 60 Hz.